Just in time for his 25th Governors Ball, the glitzy Academy Awards after-party on February 24, CNN Travel caught up with Wolfgang Puck to look back at his illustrious career and his ever-expanding empire, at his steak house CUT by Wolfgang Puck (his only New York City restaurant), at the luxury Four Seasons Hotel New York Downtown. The hotel just received its second Forbes Five-Star rating, making it the only Five-Star hotel in Lower Manhattan. Growing up in Austria, little Wolfgang Puck started cooking very early. First with his mother, then as an apprentice at a local hotel kitchen, and later at Maxim’s in Paris. After a few more high-profile European restaurant stints, Puck decided to move to America. He was only 24. Before the 1980s, no restaurant in the US was serving goat cheese, let alone putting it on a pizza. Puck popularized this kind of ingredient-forward dining, introducing a whole new culinary vernacular to menus across America. In the intervening years, he has amassed an empire of signature restaurants all over the world: Spago restaurants in Las Vegas, Hawaii, Istanbul and Singapore, his steakhouse CUT in Beverly Hills and New York (both housed in Four Seasons hotels) and two others in London and Dubai. And so many more restaurants, along with his signature kitchen products, his myriad television appearances, columns, cookbooks, hotel partnerships and Wolfgang Puck Catering. This year marks his 25th overseeing the menu at the Academy Awards’ gala, the Governors Ball. Wolfgang Puck Catering runs venues in 50 locations around the world, including sports arenas, museums and airports. But this decadent Hollywood celebration, with 1,500 guests, is definitely its most marquee event. This year’s menu features Scallop Ceviche and a vegan Opal Apple Summer Roll, alongside many Puck classics like Nashville Hot Fried Quail and Black Truffle Chicken Pot Pie. Back at CUT in the Four Seasons Hotel New York Downtown, the chef is almost out of his chair with excitement to get our crew into the kitchen to meet his team of diverse young cooks, and so we could watch him prepare an other-worldly 40-ounce Tomahawk chop from Creekstone Farms. Puck’s passion for cooking, teaching, innovation and his global team of chefs are palpable. 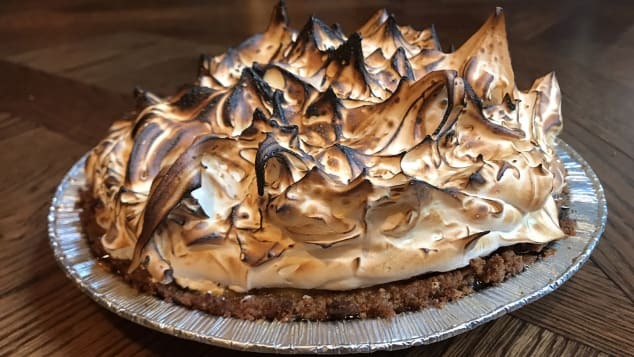 After Puck prepared the steak, he worked with pastry chef Zairah Molina (who is married to executive chef Raymond Weber), artfully preparing a Yuzu Key Lime pie with Toasted Brown Sugar Meringue and Graham Cracker. CUT was designed by famed French interior designer Jacques Garcia, and he grinned with pride as he pointed out the priceless works of art on the walls, curated by his Ethiopian-born wife, Gelila Assefa Puck. For the main dining room, Assefa Puck commissioned a diptych by Alex Israel and Bret Easton Ellis, called “The Chef,” as well as pieces from Julie Mehretu and one of Tracey Emin’s handwritten neons. The Pucks’ affinity for art and architecture will next be on display on Los Angeles’s Pacific Coast Highway. They’ve teamed up with Frank Gehry to create and design a seafood restaurant which will replace Gladstone’s that has operated on the site for over 50 years, perched on a cliff above the Pacific. The timeline for the Puck-Gehry project isn’t finalized — it was just approved last April — but one thing is for sure, Wolfgang Puck is not anywhere near done. This article was written on 28 Feb 2019.